Chrysalis' bread and butter is professional concerts. We can provide a full-length program, or appear alongside other chamber groups or soloists. Venues are ideally small to medium, i.e. 30-500 seats. We enjoy playing in a variety of spaces - previous venues include the South Melbourne Town Hall, Collingwood Underground Carpark, the North Fitzroy Library and St George's Anglican Church, Travancore. House concerts are a beautiful way to experience chamber music. They are intimate and engaging, and can be theatrical or casual, depending on the event requirements. Chrysalis is a versatile and open-minded ensemble, and are always eager to hear new ideas. Chrysalis is also available to play at corporate, private, or public events, both as a feature item and as background music. All three members of the trio have years of experience playing for events, including weddings. They don't just come as a trio - if you'd like a smaller or larger group, or if you'd like a particular instrument or singer to join them, please feel free to ask. If you would like Chrysalis to play at your event, please contact them here. Due to the delicate nature of their instruments, Chrysalis have certain conditions that they must have in order to play. If the event is outdoors, there must be shelter from sun (this can be a marquee, or a large tree). If there is threat of any rain at all, even a fine mist or drizzle, Chrysalis cannot play, even under a marquee. They are very happy to relocate indoors and continue playing. Melina's harp must not be positioned in direct sunlight. 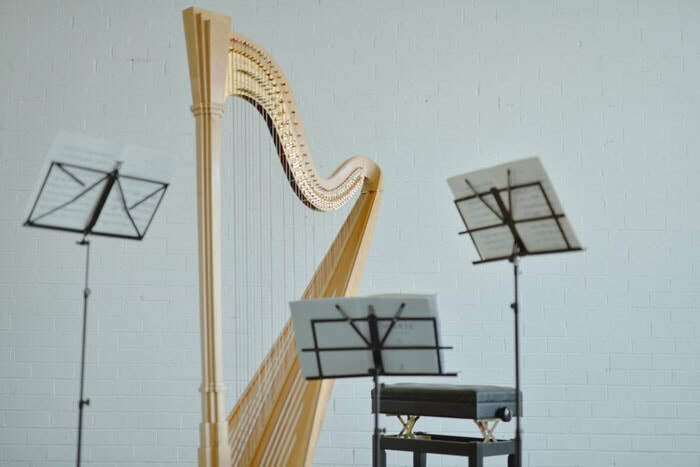 Dirt or concrete surfaces will require the use of an unobtrusive wooden board for the harp to be set upon. For indoor events, Chrysalis requires sufficient lighting to see their music by. This can be provided with natural lighting, overhead lighting, or standing lamps. For specific dim-lighting situations, please contact the trio. Music sconces can be arranged. Chrysalis trio requires an area of about 4x2m in order to play.